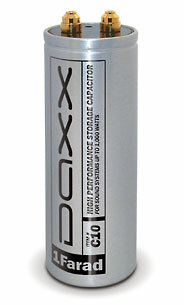 DAXX C10 capacitors will increase the performance of your system by providing a high-energy power reservoir. These high quality caps provide your amplifiers with clean transient power whenever they hit a peak output during low bass passages or high musical transients. 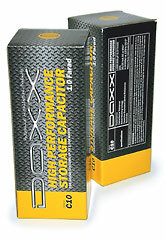 The capacitors feature high quality 99.98% pure aluminum high voltage foil and multi-processed weld. They also utilize spin down technology for low ESR and resistance to vibration. Comes with clear mounting brackets, 24 kt gold plated terminals, and charge/discharge resistor. The capacitor protection device DAXX C88 with digital voltage display mounts directly to the top of any standard capacitor and provides over/low voltage controlling, reverse polarity and short circuit protection. The device guarantees proper capacitor charging (no need to use charging resistor) and soft turn on with 10 sec delay for surge current controlling. Unit: each item per box.